ParkNow Germany - Find. Park. Pay. All in one app. On- and off-street. Parking can be so easy. The future of parking is here. Redefining parking with convenience and innovation. All easy with ParkNow. No more hunting for coins. No more tickets. Automatic payment via direct debit or credit card. Parking everywhere. At all times. Find parking throughout Germany and Austria with ParkNow. 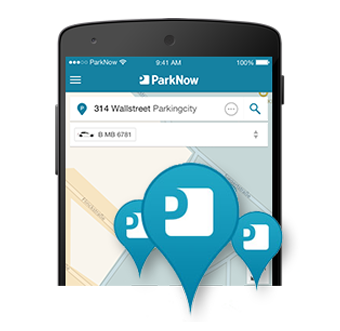 Search for the perfect parking space on- or off-street using our real-time ParkNow app. Start parking on-street with just one click. Or simply drive into your preferred car park for off-street parking. No ticket needed. Stop your parking session with one click in the app, or by driving out of the carpark. At the end of each month the total parking fees will be charged automatically to your credit card or bank account. It is very easy to find and pay for parking with the ParkNow app. New innovative features, such as the reservations function, will be introduced continuously. Many cities around the world offer the advantages of ParkNow’s innovative parking service already today. All available and planned locations are waiting for you.